The Canon EF 85mm f/1.8 USM is a very popular mid telephoto zoom lens from Canon, specifically for portraits on full frame and APS-C bodies. Many APS-C shooters tend to gravitate towards the EF 50mm f/1.8 STM for portrait work since it gives a similar field of view to an 85mm lens on a full frame body. Personally I prefer to shoot between 85mm and 135mm for portraits on my full frame 6D so this lens comes in at the bottom of my preferred focal range. The Canon EF 85mm f/1.8 USM is a more budget priced mid telephoto zoom lens that is generally reviewed very well and is a fourth the price of the EF 85mm f/1.2L II USM. This lens does exhibit a slight amount of pincushion distortion but it is easily fixed in post when using software such as Lightroom or Canon’s own DPP that comes with their DSLR cameras. Additionally if you shoot in JPG with most Canon EOS DSLR cameras the cameras can correct for this distortion as well. Wide open this lens exhibits a lot of CA, but most modern Canon DSLR’s offer in camera correction when shooting in JPG, and if you shoot in RAW this can be easily corrected using software such as Canon’s own DPP or Lightroom. Overall I am not bothered by the CA since it’s so easy to fix in post. Build quality is in line with the better consumer grade canon lenses. The body is primarily high quality plastic composites with a metal lens mount. Lens hood has a unique push button release rather than the more traditional bayonet mount. 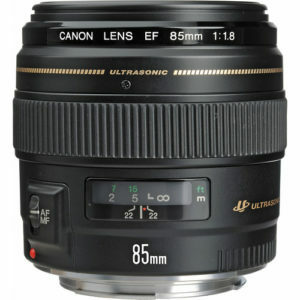 If you are looking for a great portrait lens that wont break the bank then take a good look at the Canon EF 85mm f/1.8 USM. This lens is useful for more than just portraits, though, it will find use for sports shooters in low light and can be a great landscape lens as well. This lens does not have a lot of competition other than the new Tamron 85mm that does have image stabilization. However in my very brief side-by-side comparison the Canon was sharper, so I would be hard pressed to recommend the Tamron over the Canon. Not to mention the Canon is significantly smaller and lighter, although the Tamron is better built. Overall the Canon EF 85mm f/1.8 USM gets a strong recommendation from me. based on 3055 user reviews online.